Looking for an awesome, easy and fun Fourth of July craft for kids? 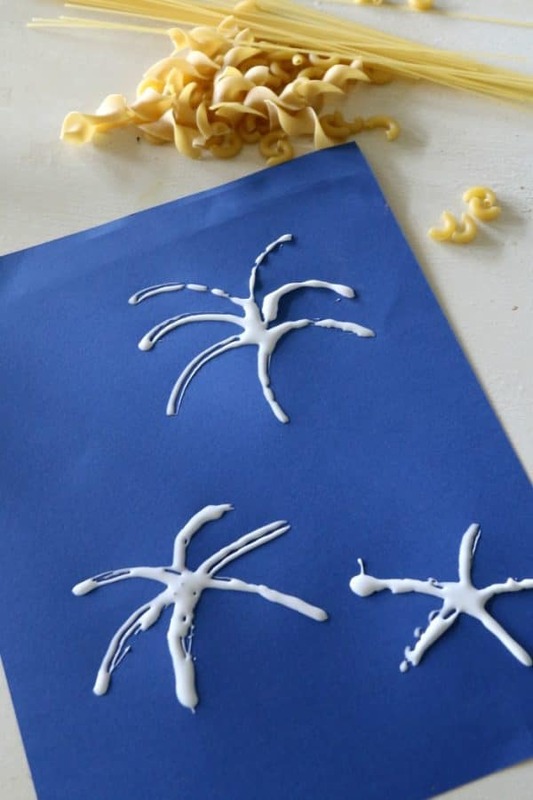 Great for any age, you can whip up this 4th of July craft that is as unique as the pasta you have in your pantry! For us, we had these three different shapes, which consisted of macaroni noodles, thin spaghetti, and curly noodles. We also had pasta shells, but they seemed a little difficult to use for this craft so I put those back for another day. Fourth of July craft for kids? 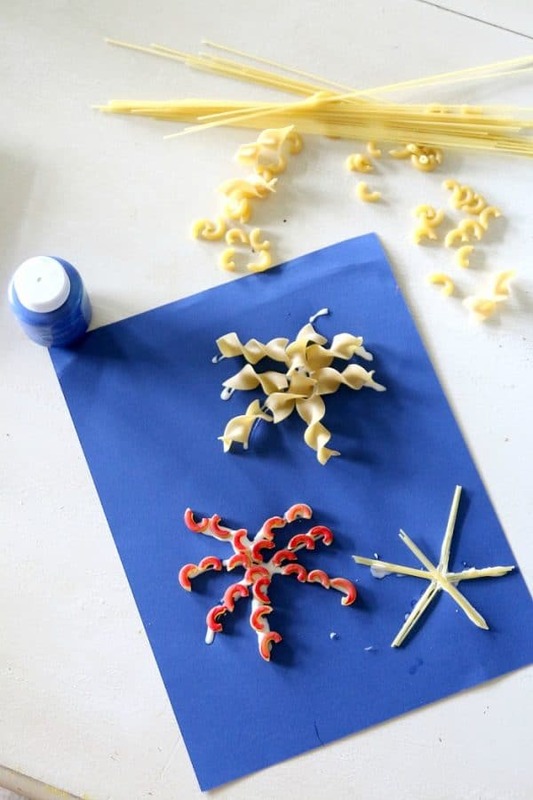 Great for any age, you can whip up this 4th of July craft that is as unique as the pasta you have in your pantry! For us, we had these three different shapes, which consisted of macaroni noodles, thin spaghetti, and curly noodles. We also had pasta shells, but they seemed a little difficult to use for this craft so I put those back for another day. All you need to do is “draw” out firework shapes on a piece of dark paper to begin. Firework shapes look basically like palm trees so start in the middle and draw lines out that droop down. 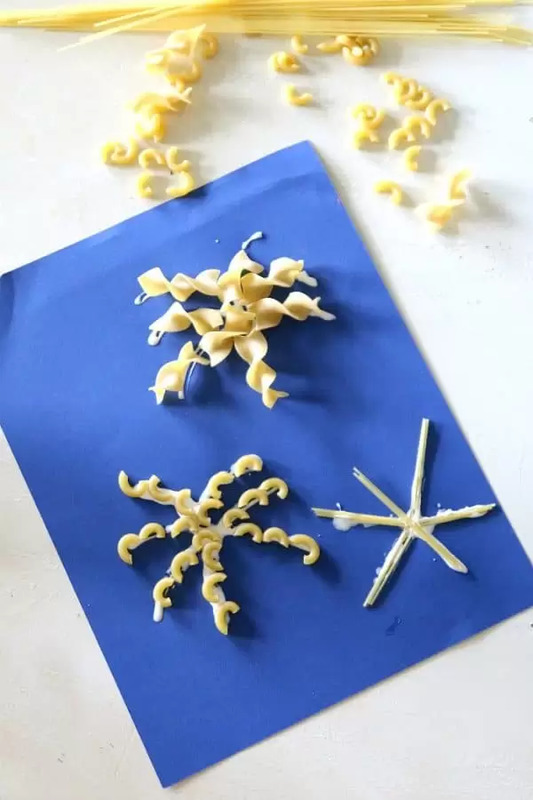 Then add your pasta shapes, not being afraid to overlap or break the pasta to create the firework. While you can wait till they dry if you prefer, we only waited a few moments before painting our pasta. Phoenyx is nearly 4 and had no trouble keeping his pasta in place to paint. Once done, let dry complete and hang…where else…on the fridge! You can start this craft over and over again based on what you have in your pantry and no two firework pages will be alike. I adore 4th of July crafts and will be adding more as the week goes on!